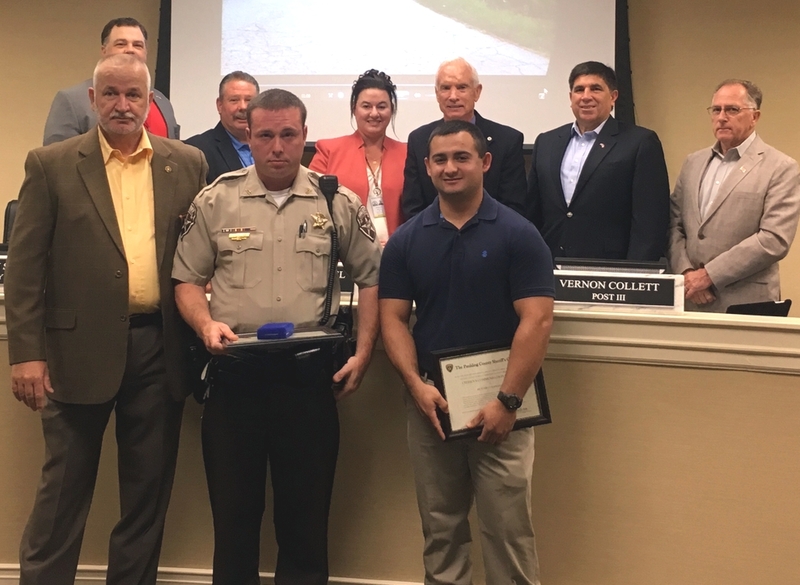 (Paulding County, GA) On Tuesday October 10, 2017 at the regularly scheduled meeting of the Paulding County Board of Commissioners, Sheriff Gary Gulledge recognized a Deputy and a citizen for their heroic actions which took place after a serious motor vehicle accident in July. On July 28, 2017 Deputy Chris Stafford and Emergency Medical Technician (EMT) Hunter Cunningham had never met. The events that unfolded that day would change that fact forever. Deputy Stafford, who was off duty at the time, was traveling on GA 101 in the area of Bud Cole Road when he saw a traffic jam and what he assumed was a motor vehicle accident. As he got closer to the scene, he realized that there appeared to be a serious accident and a trailer loaded with hay that was on fire. Deputy Stafford drove on the wrong side of the roadway to get to the scene so he could try and assist. Once he got there, he met EMT Cunningham, also off duty, who was trying to help the injured male motorcyclist. The motorcyclist had struck the trailer causing the intense fire and was thrown off of the bike onto the adjacent roadway. While other citizens watched, Deputy Stafford and EMT Cunningham shielded the motorcyclist from the exploding tires and flames because they could not move him due to what they thought was a serious neck or back injury. Deputy Stafford and EMT Cunningham, even though they were being burned by the flames, held a shirt over the face and body of the motorcyclist to keep him from inhaling the smoke and being burnt by the flames. Once EMS and Fire/Rescue arrived on scene they put the fire out and stabilized the patient so he could be transported to an Atlanta area hospital. Medical professionals later stated that if it were not for the quick action taken by Deputy Stafford and EMT Cunningham, the male motorcyclist likely would have died. Sheriff Gulledge awarded Deputy Stafford with the Medal of Merit and EMT Cunningham with the Citizens Commendation Award for their bravery and relentless will to serve. The Medal of Merit is the second highest award that can be obtained at the Sheriff’s Office. Sheriff Gulledge noted, “Men like Chris and Hunter don’t come along everyday, they are heroes and should be recognized as such. I am fortunate that Chris is one of my Deputies and that he is willing to spring into action anytime he is needed. God bless these men and the life that they saved in the face of adversity on that day in July”.